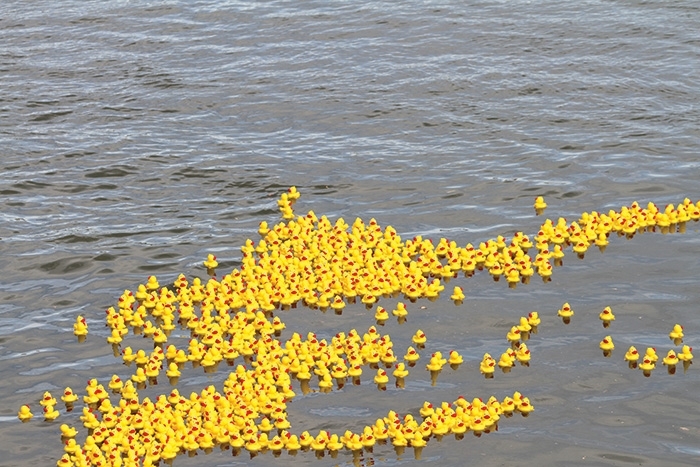 This Saturday at 12 pm hundreds of little yellow ducks will be dumped off a bridge and hit the water of the Qu’Appelle River running through Tantallon for a race to the finish line, where they will be scooped out of the water by volunteers in canoes. The eight ducks that cross the finish line first will be prize winners, with cash prizes going to the people who purchased them. This is the Tantallon Duck Derby, now in its sixth year as a fundraiser for the Tantallon rink. Les Howie, a volunteer who is helping to sell ducks leading up to the event, says the duck derby seems to get a little bit bigger every year. “It has grown,” he says. “We get a few more people every year. Corporate ducks are also sold as a way to support the event. These ducks are larger and cost more money. “If the company chooses they can buy a corporate duck,” says Howie. “They are $100. They can’t win anything except bragging rights and some real cheap advertising,” he says with a laugh. As of last week Howie said duck sales were on par. The duck derby makes over $10,000 a year for the Tantallon rink and is the main fundraiser held annually for the building. “It’s a lot of work but it’s very beneficial,” says Howie. Howie says it’s encouraging to see the fundraiser grow. “Every year it’s been getting a little bigger, there are more people at the start line, and at the finish there are quite a few more people just watching the ducks come down the river, and watching the catching of the winners,” he says. Ducks are sold far and wide for this fundraiser, which is strongly supported by many of the surrounding communities. Howie says ducks are sold in Esterhazy, Moosomin, Yorkton, Langenburg, Churchbridge, Whitewood, and even in Alberta and B.C. where some people’s relatives enjoy buying them each year. There are other events held along with the duck derby. Tickets for the duck derby are available at the Tantallon Store. Tickets for the jumbo duck race are available by calling the store at 306-643-2022 or 306-643-4446.